Should You Sell Your House Without a Realtor? If you’re buying a home in Massachusetts, you should have a radon test done. There are no requirements for radon testing in Massachusetts, but the Environmental Protection Agency recommends that all homes be tested for radon regardless of where it is located in the state. Radon is the number one cause of lung cancer among non-smokers, according to EPA estimates, so it’s important to get the home tested to determine whether you need to take steps to reduce the levels of radon in the home. Radon is a naturally occurring gas formed by the decay of uranium. There are low levels of uranium deposits in rock, soil, and water in all 50 states. Radon moves through the ground and into the air above where it disperses in low levels and doesn’t cause problems. About 0.4 picocuries per liter (pCi/L) of radon is normally found in the outside air. 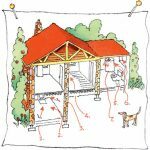 Radon levels can rise to harmful levels— 4 pCi/L or higher— when they become concentrated inside homes. When the radon gas comes up through the soil it gets trapped under the home, and that’s where it builds up. Air pressure inside homes is lower than the pressure in the ground so this causes the home to pull the radon gas into the home through cracks in the floors, walls, and gaps around service pipes. Even new homes that are well-sealed are at risk. You can’t see, smell or taste radon, so the only way you can tell if radon is present in your house is to perform a test. Homes that are next door to each other can have different radon levels so a neighbor’s test result will not be the same as the one from your home. Home buyers should get their own radon test done, even if the seller says they had a radon test done within the past two years. If the radon test comes back above 4 pCi/L, remember that radon levels can be effectively reduced and is not uncommon or cause for alarm. The buyer should request that the home seller have the radon mitigated. Home sellers should be aware that many home buyers will want to do their own radon tests. If their radon test comes back positive, it can be a setback but not a reason to panic. We typically recommend that sellers take care of the radon issue which can be fixed by having a certified radon mitigation contractor reduce the level of radon in the home. This typically costs anywhere between $800 and $2,000, depending on the method used and size of the home. When the radon level test results are above 4pCi/L, it’s not usually more than 10 pCi/L. Most radon systems can be installed in one day. If you’ve had a radon test in the past, the buyer may ask if the test was done within the past two years. If the test was done more than two years ago the buyer may want to have another one done. If you’ve made changes to the home that could affect the previous test, the buyer may want to perform another radon test as well. The radon test results must be disclosed on the seller’s statement of property condition. What Radon Tests Are Available? You can purchase home testing kits or hire a professional radon inspector. There are two types of home radon kits, short-term and long-term. Short-term radon kits are placed in the home and must remain undisturbed for 48 to 96 hours under closed house conditions. Long-term kits measure radon levels in the home for 91 days to 12 months. A long-term radon kit provides the most accurate way of measuring average annual levels of radon since they can test conditions during both the warm and cold seasons. You can find a professional radon inspector or a radon mitigation specialist through the National Radon Safety Board. Visit the Massachusetts Radiation Control Program website to get more information on how to get your home tested.